The famous George Orwell book 1984 had many cautions for mankind, including warnings about the surveillance state (Big Brother is Watching You), double speak (War is Peace), and of course effectively telling lies to the public (Ministry of Truth). In a dystopian 1984, Winston Smith endures a squalid existence in the totalitarian superstate of Oceania under the constant surveillance of the Thought Police. The story takes place in London. Winston works in a small office cubicle at the Ministry of Truth, rewriting history in accordance with the dictates of the Party and its supreme figurehead, Big Brother. 60 years after Orwell wrote 1984 and was destroyed by the book, a chilling reminder that his sinister vision is almost reality. Nineteen Eighty-Four was published in London on Wednesday, June 8, 1949, and in New York five days later. The world was eager for it. Within 12 months, it had sold around 50,000 hardbacks in the UK; in the U.S. sales were more than one-third of a million. It became a phenomenon. Sixty years later, no one can say how many millions of copies are in print, both in legitimate editions and samizdat versions. It has been adapted for radio, stage, television and cinema, has been studied, copied and parodied and, above all, ransacked for its ideas and images. Orwell never recovered from the effort of composition. He died six months after publication, aged 46. The prevailing theme in 1984 is Abuse of Power. The government, those in charge, can do anything they wish! 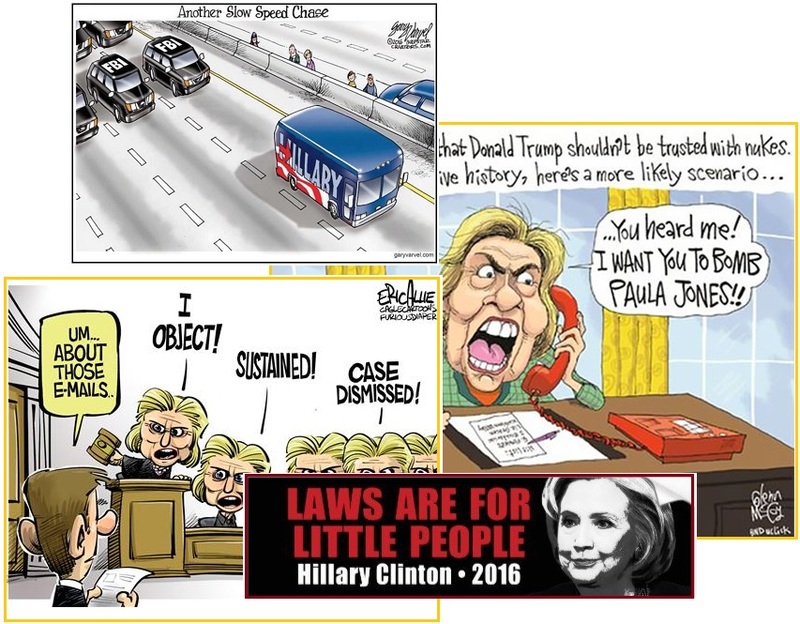 When Hillary Clinton was excused for her misuse of classified and top secret information, and for deleting government documents she swore to preserve, the phrase “laws are for little people” was born to describe her attitude. How would such a person, with such an attitude, run the most powerful government in the world? The FBI would become her own private squad of thugs, the CIA her own private hit squad, the IRS a tool to punish her enemies, and the appointment of judges and the prosecution of crimes by the DOJ anything but what might be termed justice. The Roman Gods and Overlords Flew High above the People, Committing Crimes at Will. Sound Familiar? FBI director James Comey told us on Tuesday what many of us have already known or long suspected: Hillary Clinton serially lied about her homeland-security-jeopardizing homebrew e-mail server, and the Obama administration is letting her get away with it. One standard for Jove, another for the ox. So it was in the fallen civilization of ancient Rome. So it is in corrupted America in 2016. Hillary Clinton has finally proven once and for all that the rule of law doesn’t apply to the power elite and that she can do whatever she wants without consequence. Improper use of authority by someone who has that authority because he or she holds a public office. And who would stop this? The do-nothing Republican Congress? 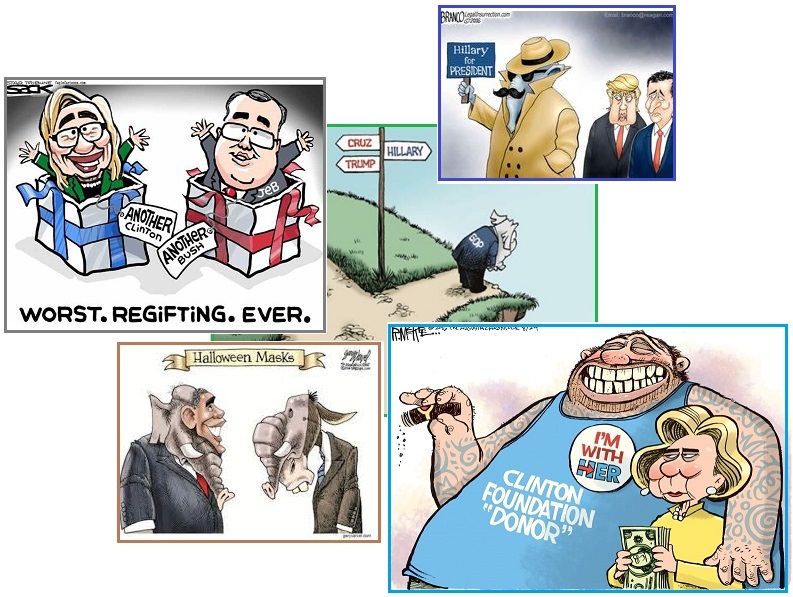 The Clintons are adept at corrupting those who would block their way to power and wealth. Are we to imagine the GOP would impeach Hillary, when the most powerful politicians in the Republican Party are now throwing their weight behind Hillary? Both the Democrats and Republicans are now behind Hillary. She stands for the status quo, politicians pigging out at the trough, starting wars that are profitable to the Military Industrial Complex. But more to the point, Hillary and Bill have seen hundreds of millions of dollars flow through the Clinton Foundation. And that’s not even counting the funds that are likely in the laundry elsewhere, like in the Caribbean. That’s a lot of money to share, and to buy cooperation! Some of the GOP’s best brains are now With Her. And, according to a source within the Clinton camp, highlighting Republicans who’ve crossed over will be a key fixture in campaign ads this fall. 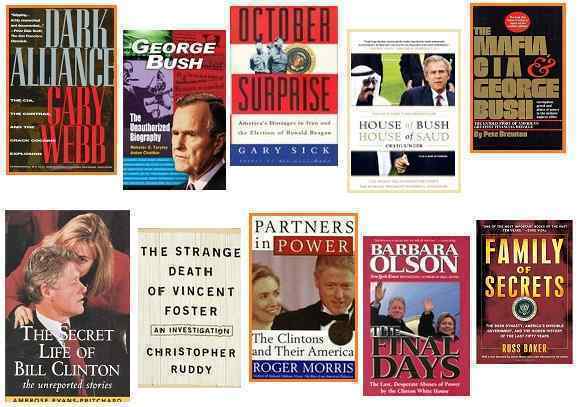 It’s not surprising that the list of converts to Clinton leans toward national security types and former Republican Party or Bush officials. Democratic presidential candidate to get backing from executives, some of whom cite unease with Trump’s candidacy. More than 50 business executives, including several longtime Republicans, endorsed Hillary Clinton for president. Another precept in 1984 is double speak – it is what it ain’t and it ain’t what it is, essentially. Hillary is adept at this already! She lies as a matter of course. She claims the Clinton Foundation is in place for charitable purposes, but only 10-13% of the funds go to charities, the rest to fun and games with the Clintons. 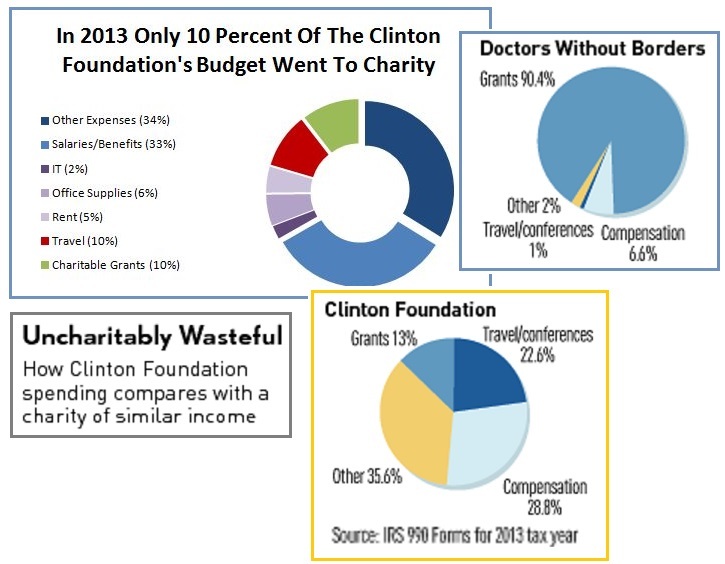 Doctors without Borders, for instance, has that reversed, with 90% going for actual charitable work. Now that’s a charity! Hillary is virtually known for endlessly telling lies, almost as a matter of course. Thus, polls show she is considered a “liar” by a huge majority of the public. What could be more appropriate for the Queen of what might become the new Ministry of Truth! Someone who is immensely comfortable with lying, who has done so for so many decades, and so effortlessly, that it has caused some to call her a ‘compulsive liar’. She says she is for fair treatment of woman but did everything in her power to dismiss and degrade and punish the woman Bill had affairs with. By an astounding margin, Americans believe that Hillary Clinton is lying to the public about her email scandal and that her use of a private server to conduct official business while serving as secretary of state put the nation at risk. A full 60 percent of the random national sample of 1,004 registered voters polled believe that Clinton is lying about her emails, versus 27 percent who believe she is not. And by a 57-32 percent margin, the respondents said she put U.S. national security at risk by mishandling classified information. Is Hillary Clinton a Compulsive Liar? Compulsive liars lie with ease and without guilt. Often they are so caught up in their lies that they don't realize the distinction between fact and fiction. Their lies may be plausible on the surface, requiring some effort to disprove. Often the lies present the liar in a favorable or flattering light or else seek to hide failure. Does Hillary Clinton fit this picture? 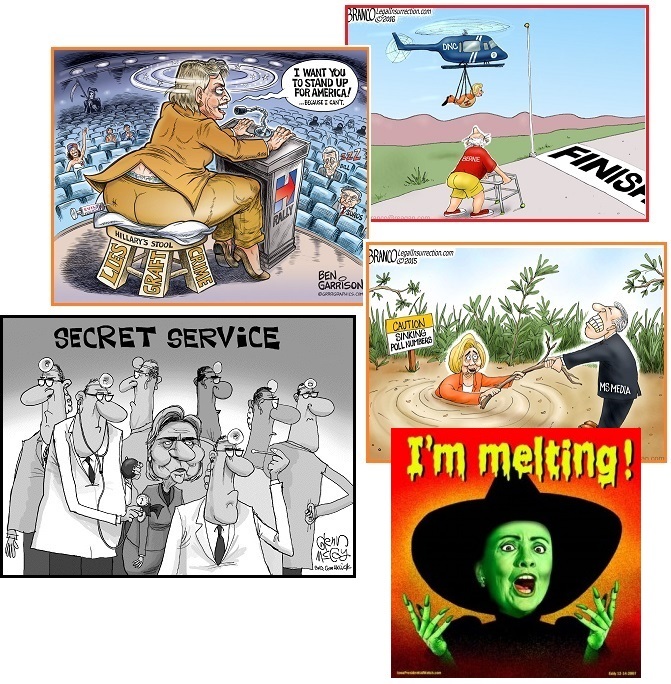 Hillary Clinton has a long history of tall tales. But lying is not a recent phenomenon for Mrs. Clinton. William Safire, of the NY Times, wrote in 1996 that Hillary "is a congenital liar." 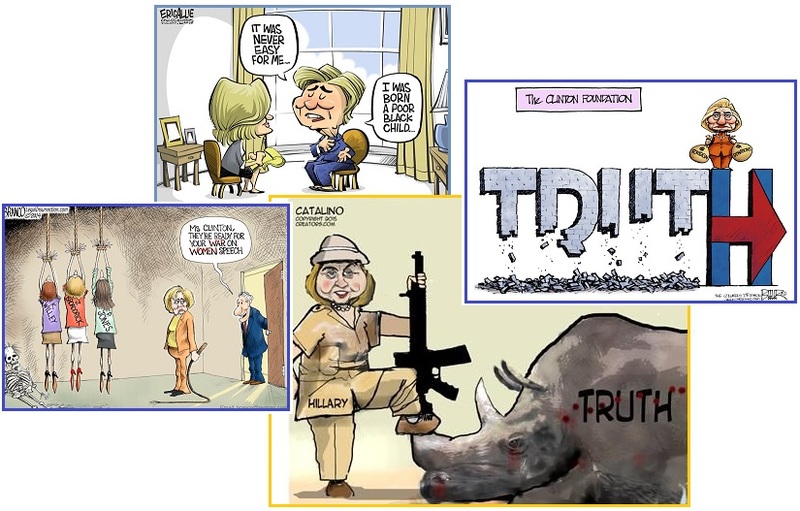 He noted a string of deception beginning in Arkansas and following her to the White House – cattle futures, Travelgate, Whitewater, lost billing records, and missing FBI files, to name some of her most prominent deceptions and cover-ups. Going even farther back in history to the 1970s, Hillary Clinton was fired from her staff position on the Watergate House Judiciary Committee over "lies and unethical behavior." And the Ministry of Truth is not waiting for Hillary to occupy the White House! They’ve started during the campaign. Despite the massive evidence that Hillary has serious health problems - double vision from MS, early dementia from strokes and hardened arteries in the brain, frequent falls, urine collection bags and a catheter, and seizures on camera – getting the truth out in the media is virtually impossible. All a forbidden subject on CNN, the Huffington Post, MSNBC, and the Daily Beast. 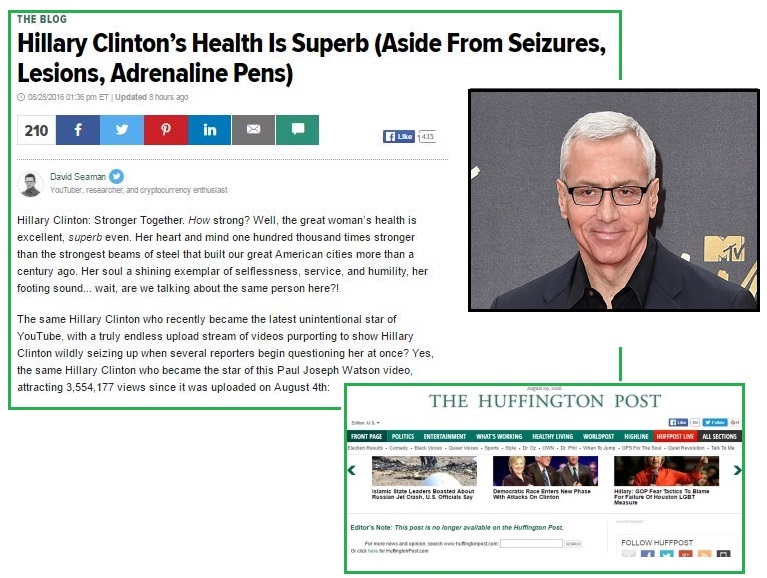 Dr. Drew lost his job promptly from CNN’s HLN when he dared to suggest that Hillary might not be all that well. Big Brother is watching, after all. Only Fox News, InfoWars, and the Drudge Report seem to be telling the truth. The decision came eight days after Pinsky’s comments on a radio show on Aug. 17 questioning the health and medical care of former secretary of state Hillary Clinton, the Democratic nominee for president. After looking at bits and pieces of Clinton’s health-care records she made public in 2015, he said he was “gravely concerned not just about her health, but her health care.” Pinsky’s views, which he said were shared by another physician with whom he had consulted, aired on KABC’s “McIntyre in the Morning.” The episode has been removed from the station’s website. The Huffington Post has sensationally censored an article pertaining to questions about Hillary Clinton’s health and banned the journalist who wrote it from posting on their website altogether. David Seaman penned a commentary piece discussing questions surrounding Hillary’s health problems. 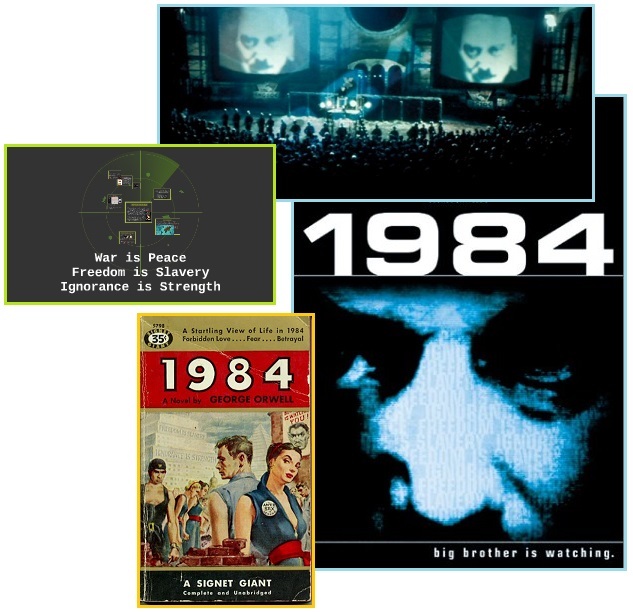 1984 has arrived, during the Hillary campaign and in the United States of America, and the media is almost fully compliant! How is it that the United States, supposedly the world’s premiere democracy, became so subverted that lies are truth and truth is a lie. The Ministry of Truth is hard at it, with their double speak. Hillary is healthy. Never mind all the evidence out on the Internet, gone viral, the seizures, the eyes dilated and unable to track together, the stumbling and falling, the mental lapses when she has an absence seizure, the signs of a medic with her constantly, the many photos and videos of her catheter and urine collection bag, her inability to hold a press conference for 270+ days. So given that the Ministry of Truth is in control in the US, and is feeding the public Hillary’s lies, should we believe the polls? Are the polls rigged for Hillary? Are they ever! When taking the poll, the respondents are asked their party affiliation – Democrat, Republican, or Independent. The percentage in each group is already known. Gallup reports in 2016 that 29% are Democrats, 26% are Republicans, and 42% are Independent. These numbers remain fairly consistent. For instance, the number of Independent voters has remained about 40% for the last five years. 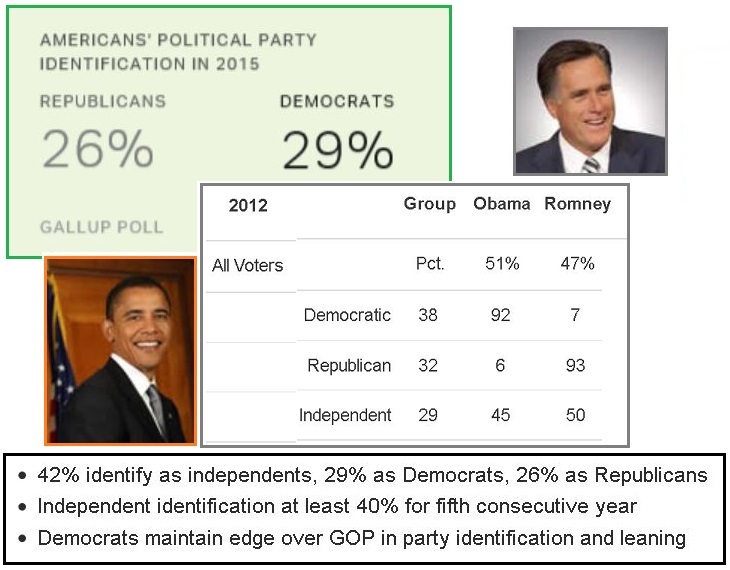 This consistency can be seen in the Cornell University analysis of the party identification during the 2012 Presidential election – 38% were Democrats, and 32% were Republicans, with only 29% of the actual voters being Independents. So would it not be logical, and in keeping with past history, to include only slightly more Democrat responses in a poll? Yet this is not what is being done! The polls are loaded with Democrat responses, to force an anticipated win for Hillary so a stolen election does not seem obvious. The pollsters openly admit they select from the results to fit a proper political leaning. They should, thus, use percentages approximating past election turnout. But instead, the late July Reuters/IPSOS poll tweaked the results they issued so that these percentages were loaded for Hillary – 899 Democrats to 753 Republicans with only 266 Independents. Data for Rasmussen Reports survey research is collected using an automated polling methodology. After the surveys are completed, the raw data is processed through a weighting program to ensure that the sample reflects the overall population in terms of age, race, gender, political party, and other factors. Over the past week, there was a troubling development for the establishment: Trump was soaring in the polls. In fact, in the widely watched, Reuters/IPSOS poll, for the first time Trump had taken an inexcusable 1 point lead following the Republican National convention. So, as we reported last night, something had to be done. 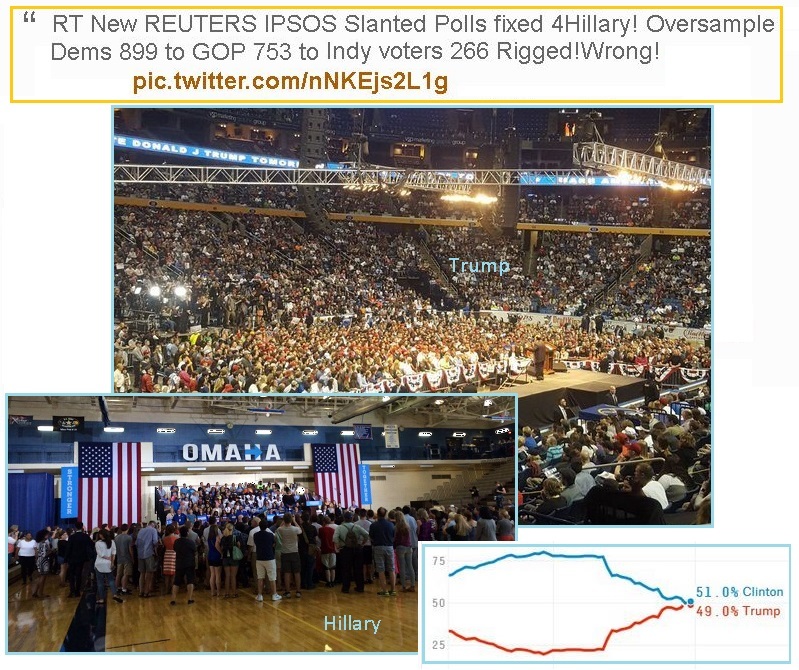 And something was done: Reuters "tweaked" its polling methodology. Donald Trump shattered the previous GOP primary record by 1.4 million votes this year — and that was with 17 candidates in the race! Hillary Clinton received 1.5 million fewer votes this year than she did in 2008 – when she lost! Trump continues to sell out venue after venue. Hillary can’t fill a high school gymnasium this week without hauling in high school kids to sit in the stands. 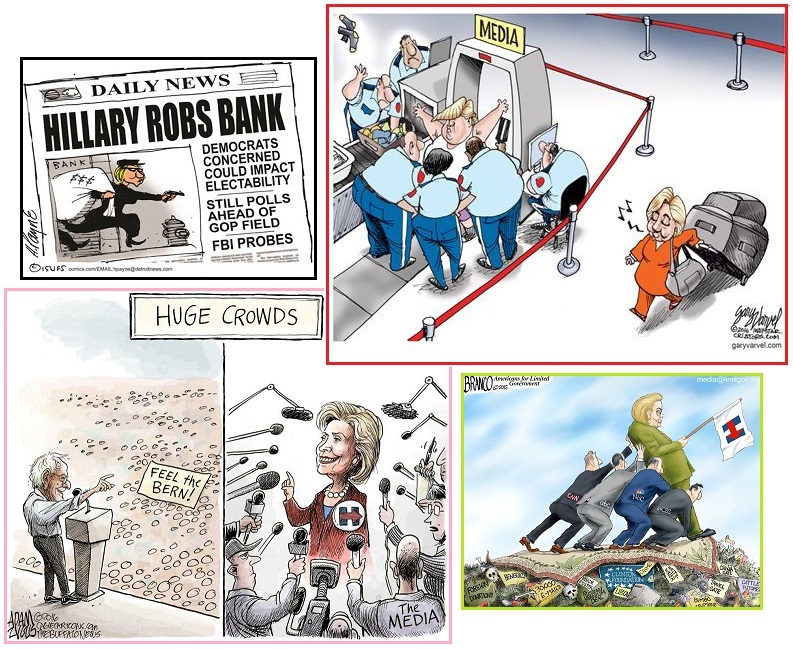 So leave it to the media to jump in and help their candidate. Reuters tweaked their polling methods this week to give Hillary a lead. Reuters -Ipsos used more than 100 more Democrats in their poll to give Hillary a lead over Donald Trump. Does anyone in their right mind think Democrats will have more people voting this year than Republicans? So if the polls are fraudulent, was the Primary stolen from Sanders? Without a doubt. The Zetas note that Sanders won the caucuses, where the counts were taken in front of crowds that were double checking the results officially recorded, but when a Primary vote was taken by machine, Hillary won. Per the Zetas, Seth Rich lost his life because he was aware of this. The power elite want Hillary in the White House because she backs Wall Street and corporations, and allies with the Saudis, just as the Bush family did. The Bush and Clinton families are two sides of the same coin. ZetaTalk Insight 8/6/2016: The obvious assassination of Seth Rich in DC was a warning to others to keep their mouths shut. A DNC employee, Seth knew more than compilation of Democratic voter lists. He knew how election theft was being conducted, the plans for this during the general election. Electronic voting machines are not secure, as the Diebold theft for the Bush family in 2000 and 2004 showed. Does no one wonder why Sanders won the caucus votes during the primary, but lost in general when the votes were collected by machine? How could this difference exist? A caucus is hard to steal, when monitors are present and recording the votes, but electronic numbers can be quickly switched or erased. Where we, in the ZetaTalk newsletter, have not done the extensive analysis on election fraud done by others during 2016, the facts are there. Just scan through some of the sites writing concerns about the validity of the upcoming November 8 election. Electronic voting is so very vulnerable to fraud. Just look at the 2000 and 2004 elections, where votes with a paper trail aligned with exit polls, but electronic vote results did not. Suddenly, this concern for the 2016 election went beyond what might be considered fringe media to the major media when it was learned that the election databases in several states had been hacked! Once again, supposedly by the Russians. This only seems to be a concern of the major media because their darling, Hillary, might lose by such maneuvers. When the Primary was being manipulated, stolen from Sanders, they looked the other way. So what is to be done? Federalize the Presidential election process. Send in the Marines! The FBI’s decision to issue a nationwide alert about the possible hacking of state election offices after breaches in Illinois and Arizona is raising concerns that a nationwide attack could be afoot, with the potential for creating havoc on Election Day. Hackers targeted voter registration systems in Illinois and Arizona, and the FBI alerted Arizona officials in June that Russians were behind the assault on the election system in that state. The Russian campaign is also sparking intense anxiety about the security of this year’s elections. Earlier this month, the FBI warned state officials to be on the lookout for intrusions into their election systems. 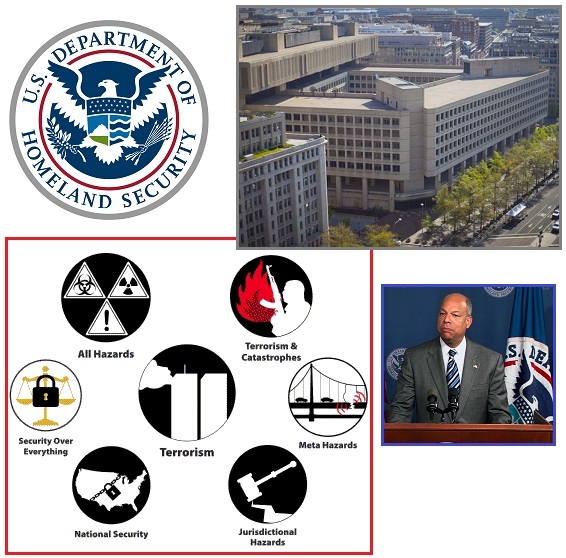 Even before the FBI identified new cyber attacks on two separate state election boards, the Department of Homeland Security began considering declaring the election a "critical infrastructure," giving it the same control over security it has over Wall Street and the electric power grid. The September 5, 2016 presentation on USAEBN covered the History of the Prongs. This comprehensive hour is as usual on YouTube and concludes that we are poised for the “discovery” of Nibiru in the inner solar system by the international team of astronomers working on discovering exoplanets. Other recent presentations in collaboration with Nancy and USAEBN include Wobble Proofs, and Martial Law vs National Emergency. All valid subjects given the uncertain time we live in.